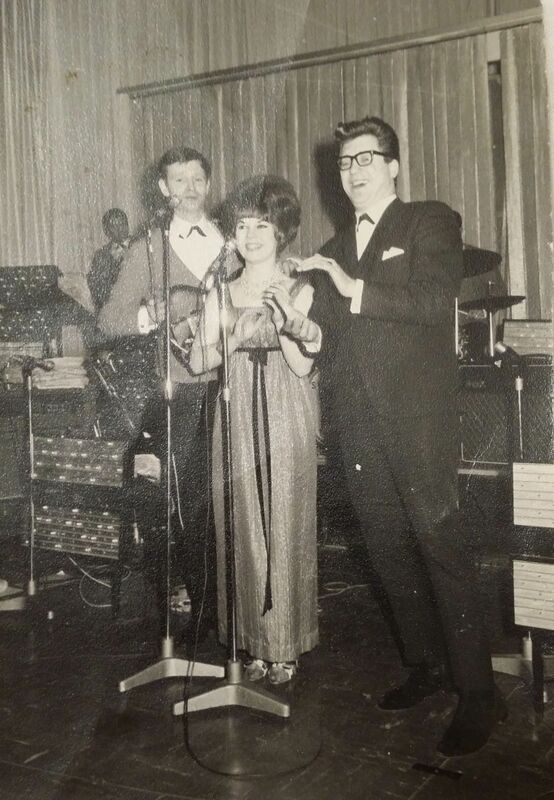 I was a guitarist/vocalist with the Syd Dean Orchestra for the period approximately 1960-1966. I have just discovered this great website, and look forward to contributing and reading more of the wonderful stories and experiences from everyone who has a connection with the Regent Ballroom, Top Rank Suite and of course the legendary Syd Dean Orchestra. The photo was taken at the Top Rank Suite, uncertain about the date, probably a year or two after it opened in 1965. I am the one on the left with the guitar. Sad fact is that it was stolen after a private function at the Top Rank Suite not long after this photo was taken. The lady is a wonderful vocalist called Barbara Hermans. Member number three of this happy trio is a great vocalist from Bristol called Gordon Summers. Gordon was also married to a pretty young lady named Marie I think, who was the disc jockey at the time. The person just visible on the top left of the picture is a Don Pashley, a tenor saxophonist in Syd’s Orchestra for many years. Where did you go dancing in the 1960s? Share your memories by posting a comment below. Message for Ray Sinclair (Raymond Hicks). Please get in touch … would love to catch up. Editor’s note: Barbara – if you want Ray to email you directly you have to show your contact in the body of your message. I used to go to the Top Rank Suite on a Saturday morning from 1966 onwards. It was a youngsters’ disco and was fab (I was 10 in 1966). I remember the blonde DJ called Marie who was great. Is this the Marie mentioned? I really loved her trendy outfits – she used to leave the Top Rank Suite in a red sports car with her white poodle. How I wished I was her!